Over the past week, the systematic victimization of women in Hollywood by a serial sexual predator has caused many women to look at their own life experience and consider whether they have also been the victims of sexual harassment, or worse, in their workplace. Today I have been watching the intensity of the #MeToo campaign build and I have been thinking of the experience with sexual harassment of most women physicians and medical students, including myself. As a physician who trained in the 1970’s at McGill University in Quebec, I studied medicine in my late teens and early twenties. When I applied to medical school, I was asked by one interviewer, “Are you interested in getting married?” Having always been a little too smart-mouthed for my own good, I answered, “I’ve only just met you. Can I have some time to think about it?” But over the years of repeating that story, no one was ever surprised that someone (a man) asked me this question. My women colleagues and I became used to professors and staff physicians and senior residents enquiring about our menstrual cycles, our marriage plans and commenting on our suitability for senior leadership roles. At the time, I suspect that most women medical trainees were like me. We took for granted that this treatment was typical in medicine. All trainees were subjected to humiliation, verbal abuse and a work load that was essentially equivalent to slavery. The sexual harassment that woman trainees experienced was influenced by a medical environment, but women were mistreated in all work environments. 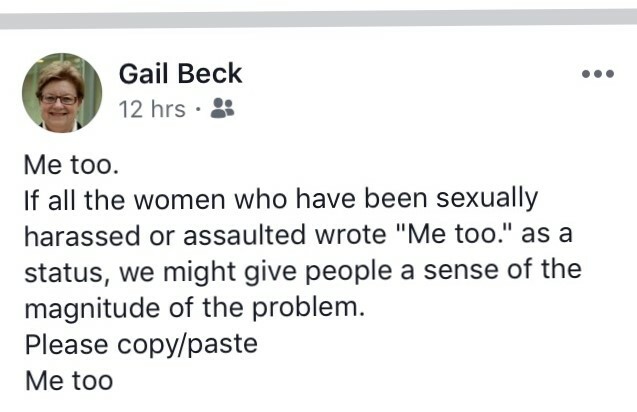 In fact, the term sexual harassment may have been coined at Cornell University in 1975, but that was not the literature medical professors considered valuable. Over the past forty years, with both male and female colleagues, many of us are working to change this culture in medicine and we even have days when we believe we have been somewhat successful. We can say that there is now excellent evidence that respectful medical workplace behavior is still a problem and that every physician or medical student or resident should now be aware of the principles of medical professionalism and disruptive behavior. That’s it, however. That’s the extent of our progress: that we should know better. Medical students and residents continue to tell us that there is a problem and women doctors and medical students on Social Medial today are recording their #MeToo’s along with women in every other profession. Many women in medicine will say that this misogynistic treatment occurred mainly when we were students and residents, but it is just not true. Women are still being passed over for academic promotion, hospital leadership roles, association leadership roles and even association awards. If you look through this list of winners of the Canadian Medical Association’s Frederic Newton Gisborne Starr Award, you will find the name of one woman. Even if you don’t count all the early years of the CMA when women couldn’t be doctors in Canada – not one of the best reasons for this low number of women award winners, mind you – it is still a sad statement about how women are regarded in the profession. Finally, and probably most telling, the specialties in medicine with the lowest fees are those dominated by women. From the moment in an admission interview that I gave that sarcastic answer to an inappropriate question, I have been working for medicine to be a more positive profession for women. The number of women in medicine has grown, but we still work harder for recognition than our male colleagues. We still do not call out sexual harassment in medicine to the extent that we should. For all my women colleagues who think I am exaggerating, I suggest that you have a conversation with some work friends about your own experiences in Medicine.